Figured I'd dip my toe into the color challenge today! This snake we spotted while on a nature walk in the Mistico Arenal Hanging Bridges Park (highly recommended, but may be quite the challenge to those scared of heights, the bridges hang about 100 feet from the ground). 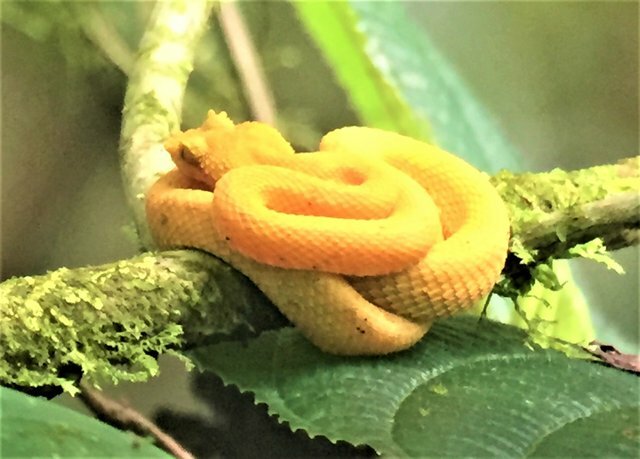 The snake is known as the eyelash pit viper. Careful though, its venom is highly toxic to the central nervous and cardiovascular systems, and can be fatal. While they are not known to be aggressive, it will attack if some silly human harasses it or gets too close for comfort.